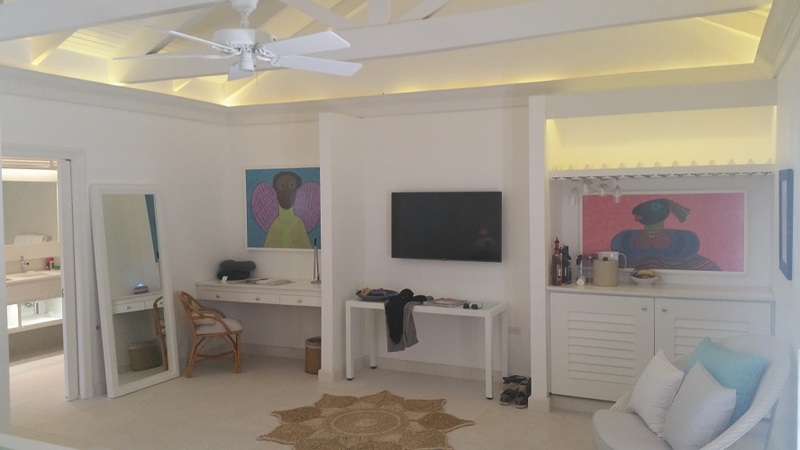 We recently returned from a corporate FAM (familiarization) trip to Jamaica’s Couples Oasis Spa Villas at Tower Isle, an all-inclusive spa resort, where we had the unique pleasure to enjoy the newly completed Spa Villas, and I could not wait to write this review/blog and share this amazing property with you! The villas have only been available since early 2017 and after our outstanding experience here, we can not believe what an excellent value these villas are for our groups that want extraordinary spa experiences. At the end of this post, I’m going to give you a breakdown of costs and you’ll see for yourself why I can’t believe what a deal the villas are! Most travel groups going to all-inclusive resorts are looking forward to the freedom to eat and drink whatever they decide, and not having to be concerned about the check at the end of the day. A traditional all-inclusive resort typically includes your room, food, and beverage, and sometimes the resort will include some other activities, like water sports or evening shows. This is where Couples Tower Isle, in Jamaica, has truly outdone themselves with the release of their new Spa Villas! For our spa travel groups, you now are not only able to enjoy the standard all-inclusive food and drink, AND all-inclusive excursions and activities, you’re going to go crazy for the Caribbean’s first all-inclusive spa experience, where you can also enjoy as many spa services as you’d like! Yes, you read that right – completely unlimited spa services are all inclusive when you stay in one of the Spa Villas at Couples Tower Isle – a true all-inclusive spa resort! And it’s totally as awesome as it sounds! Shea and I decided to check this out for ourselves, and enjoy a romantic spa getaway, when we booked 2 nights at the Spa Villas in July to celebrate his birthday. 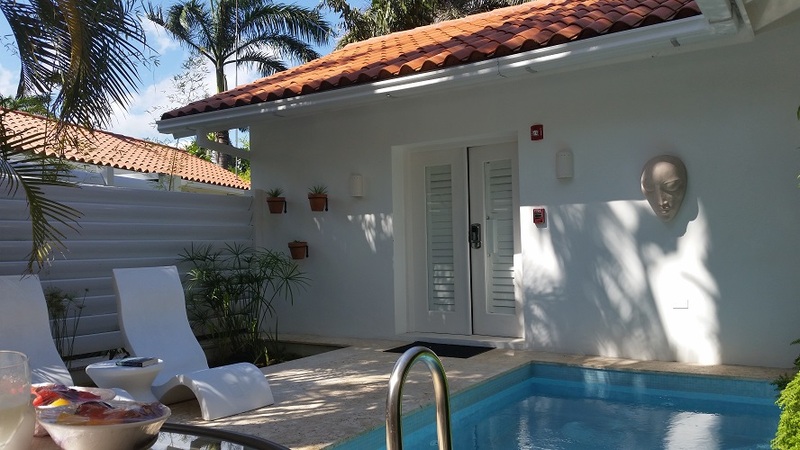 We were already set to be in Jamaica to tour all of the Couples properties for one of our tour groups, so we decided to check in a little earlier and give the Spa Villas a test run for ourselves. We arrived into the Montego Bay airport on a Friday late in the afternoon and zipped right through customs, with the help of Club Mobay (which is a definite must, in my opinion). Once in our private shuttle (which you receive as a part of the stay in a Spa Villa), it took a little under 2 hours to arrive at Couples Tower Isle. We were exhausted after a day of traveling and ready to flop into bed by this point but we were promptly greeted by Stacian, the Spa receptionist, who took us to the spa for a tour and then to our awesome room. Once we were all settled in we were so hungry. We grabbed a bite to eat at the Pool Grill and headed over to the spa for our first service – a much needed couples massage! I’ll back up for a moment here and let you know that we were in contact with the spa prior to arrival, so we had this appointment scheduled before we even arrived (view Spa Services here). So glad we did this as we were so tired from traveling that we were already in the “barely thinking straight” mode and if this were not already scheduled we would have probably just passed out in bed for the night and missed an awesome relaxing massage. Our couples massage was nothing short of amazing! As serious spa lovers, both Shea and I have had many massages throughout our life, in many countries and in many settings, and our massages were among the best we had ever received. The spa staff, as we would learn over the next couple days, is nothing short of outstanding. We found out that several of the therapists had been with this property, serving in the spa, for nearly 20 years! That’s a crazy amount of experience in spa services, let alone at one property for so many years. No wonder they were so amazing – they have so many years of experience. Saturday was our full-on Spa Day, where we started at 9am and did not leave the spa, except for lunch, until nearly 8pm! For real! Who knew that spending a full day at the spa could be so draining? But oh, was it ever so fabulous! This was exactly the romantic spa getaway we were looking for! I loved ending the day in the spa by having my hair styled, and I highly recommend it. It was so nice to not have to worry about it, after a day of relaxation, and just get dressed and head to dinner with my husband. We started our Sunday off with even more spa time! Then both of us – Couples Bamboo Massage 80 mins. After our last couples massage, we checked out of our spa villa and checked into a regular room at Couples Tower Isle for the remainder of our time here, before we moved over to Couples Negril, yet another fantastic property. I’d be remiss if I didn’t talk about the spa villa (the room) itself, because it was also wonderful. There are 2 spa villa types – the Oasis Spa Villa and the Signature Oasis Spa Villa. The main difference is the size (Signature Oasis Spa Villa is the larger villa) and the fact that the Signature Oasis Spa Villa has a separate living room/lounge area and an outdoor shower. We stayed in the smaller Oasis Spa Villa, though I’m not sure I’d call a nearly 500 square foot hotel room small. 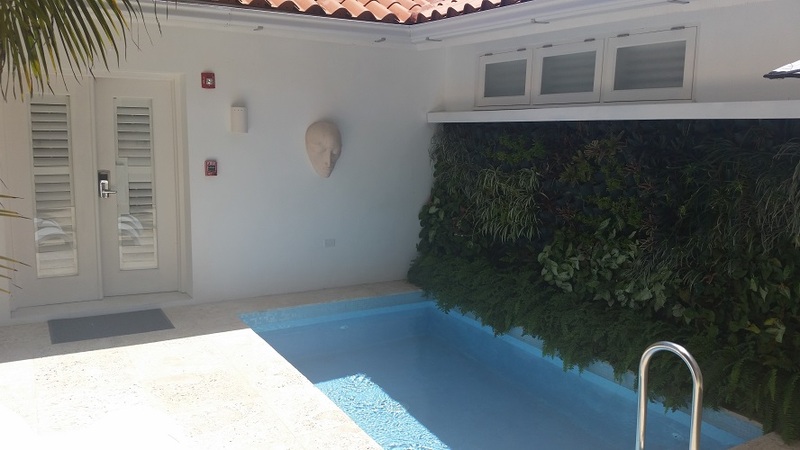 You walk into the villa through your own private courtyard, complete with your own private plunge pool. I wasn’t for sure we’d even use the pool at all but ended up chilling out in here a few times. 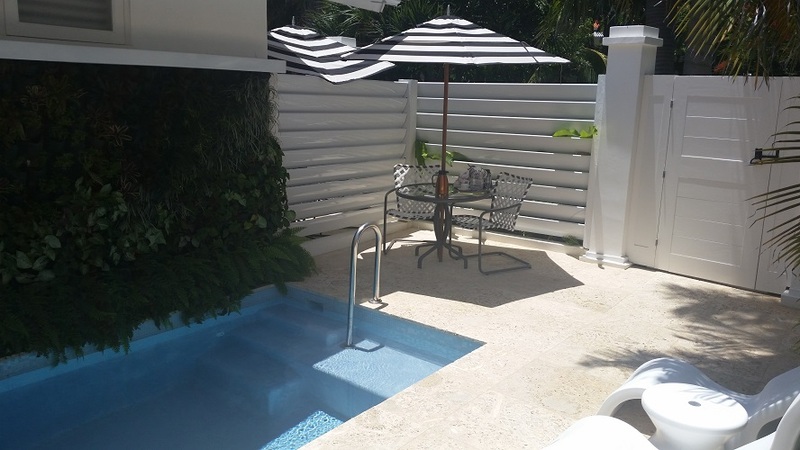 We’d have our breakfast delivered to the room every morning and eat in the courtyard, then hop in the plunge pool for a bit before showering and heading to the spa. And the plunge pool was a great place to relax at night before bed. 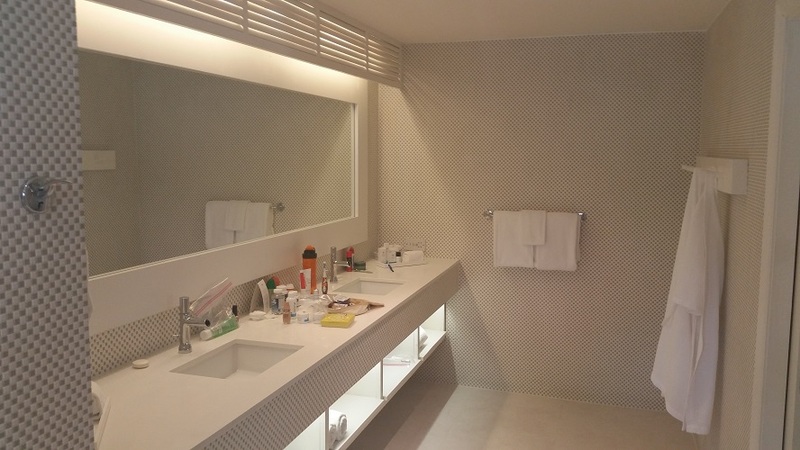 I know this may sound weird but one of our favorite things about the spa villas was the bathroom! The showers are huge and have shower heads on opposite walls, so you can both shower at once without even being in each other’s way. And there is a ton of counter and mirror space. I added up the total cost of all the spa services we received and the total was a whopping $2,750! Can you believe it?! And all we paid was $1358 total for our stay. *Price may vary, depending on time of stay. The cost you’re seeing here only represents what we paid when we stayed in the Oasis Spa Villa. *Since our stay there is now a 3 night minimum for Spa Villas. What would we have done differently? Because we only had 2 nights to enjoy our spa villa and unlimited spa services, we basically stuffed spa services into every moment we could. Yes, it was amazing, but it was also really too much. Ideally, we would have had a couple more days to spread things out. For our Spa Lovers Travel Groups we would recommend staying 4 – 5 nights in the spa villas, so you can spend maybe 3 – 4 hours max per day doing spa services and the rest of the time enjoying the services at the resort. For example, because we were trying to maximize our spa time we missed out on the excursions to Dunns River Falls, local shopping, and all the water sports that we would have liked to have enjoyed. Fortunately, we went on to stay additional nights in a regular room at Couples Tower Isle and then 3 more nights at Couples Negril, so we were ultimately able to enjoy some great events, like the glass bottom boat ride, the catamaran cruise, a trip to Rick’s Cafe, and a few other fun activities. Couples Tower Isle doesn’t promote tipping of their service staff, but the spa is different. Since the people that work in the spa are in essence “outside contractors” they do accept tips for outstanding service. It is not required at all but I would recommend tipping at least 10% of the value of the spa services that you receive. The rooms are for “couples only” so the maximum occupancy for each room is 2 guests. 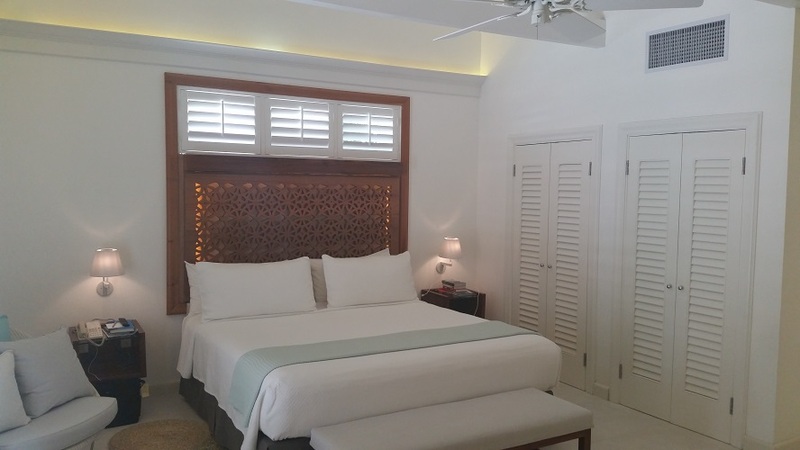 Moms and daughters, best friends, and couples will all be comfortable in their King sized beds, but please be aware that there is only 1 bed for sleeping options in each villa. There are only 8 Spa Villas, so our Spa Lovers Travel Groups need to book well in advance to be able to get all of the rooms the group needs, as they are becoming very popular. No need to bring a robe. You’ll both have one in your room that you can wear back and forth to the spa. The Spa Villas are somewhat secluded from the rest of the resort so it’s nice and quiet. This also means that you’ll have a small walk to get to the beach, by going through the main resort, to get to the beach side. There are a lot of excursions and fun activities to do at Couples Tower Isle! We recommend checking in with the activities desk on your first day, to sign up for the excursions, as they do fill up quickly during peak times. Not so much a “need to know” but definitely noteworthy – The people here are so, so very friendly. And very laid back. But whatever you need – fresh towels, room service, whatever – the staff is so quick to respond and take care of you. It is truly a relaxing and pleasant environment. Overall, the Spa Villas at Couples Tower Isle are an excellent value for luxury accommodations and services without the luxury price tag! I would highly recommend this type of all inclusive spa vacation for groups that are spa lovers, couples groups, and romance travel (like honeymoons and anniversaries). 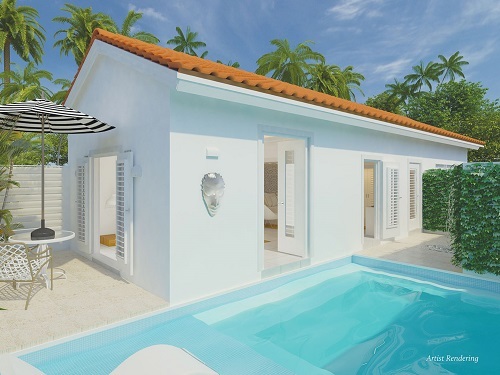 You can’t help but reconnect with one another while enjoying these luxurious spa villas! Want us to plan your perfect Couples Spa Getaway group? Give us a call at #512-955-1320 or click “Ready to Get Started” below and we’ll get you set up with your very own all-inclusive spa vacation!